Last night, I dreaded this morning. I knew I would have to get Elspeth and myself up early and ready quickly in order to make it to the hospital by 9am. Breakfast was scoffed, bathtime was a hurried affair, and we caught the bus with seconds to spare. Once at the hospital, questions were asked and my stomach was prodded, and all was declared to be perfectly fine. My blood test results are great, my blood pressure is normal (I can never remember the numbers; as long as they tell me it’s fine, I’m happy), the fundus is measuring 27cm (which is spot on for this stage of pregnancy), nothing is abnormal or worrying. Probably the only unusual thing to happen was Elspeth tickling my toes as I lay on the table! So then the midwife was finished with me and sent me on my way, and I realised it was still early. Elspeth was behaving, I was feeling oddly energetic, so what to do? Of course! Child’s Play! 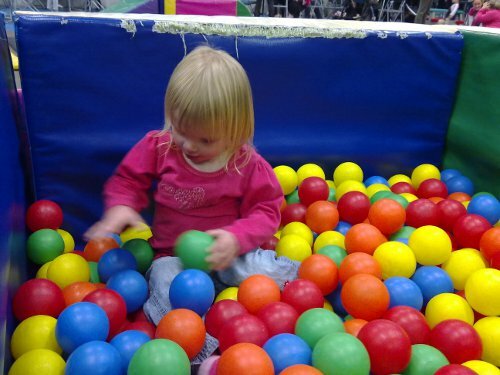 On a day like this, any normal playground or other outdoor activity is out of the question, so a wonderful big indoor play centre for the under-fives seemed just the thing! And best of all, it’s only a short walk from the hospital – even with a flat tyre it wasn’t a problem for pregnant me + pram. To me, Child’s Play seems just a big room filled with rubber matting and foam things and stuff. But to children, it appears a veritable heaven of playtime! They adore it, and Elspeth is no exception. We spent over an hour there, and even then she didn’t want to leave. I’d have stayed longer, but I really needed to pee. And so the toilet was visited, a quick grocery trip was done – that was where I expected tantrums, but there was only one brief yell – and we didn’t get home until midday. We read a couple of books, and then it was nap time! Oh, glorious nap time! I’m surprised I didn’t just pass out on the couch myself, but I thought I should blog instead! This entry was posted in Family and tagged children's activities, elspeth, evelyn, health/medical, pregnancy.